The town of Monroeville – where Lee still lives part of the time – boasts Lee as its claim to fame. The town hosts an amateur performance of a play based on Lee’s novel every May (billed as “Alabama‘s hottest theater ticket”). 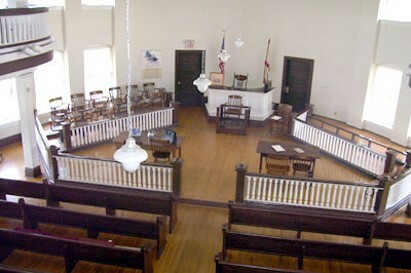 The play is staged in the Old Courthouse, which was the inspiration for the Maycomb County Courthouse of Lee’s story – the place where Atticus Finch makes his impassioned defense of Tom Robinson (see photo above). The courthouse is also a year-round museum with three permament exhibits, including one on Lee and another on Capote. In town, there is also a guided tour, pointing out local spots of note to fans of Lee and Capote.